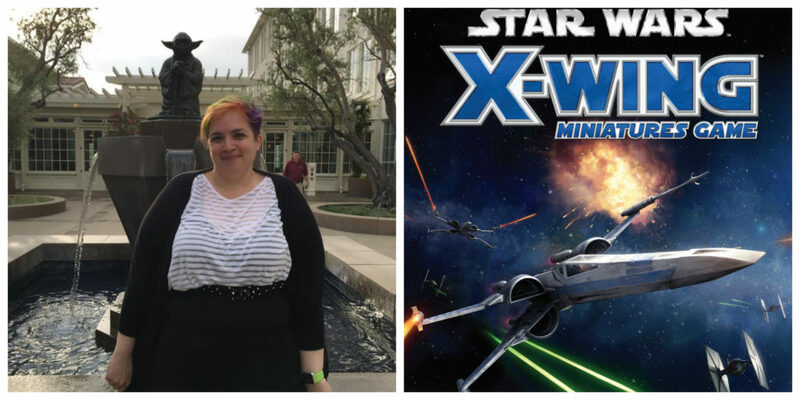 Simone Elliott is the Licensing Manager at Fantasy Flight Games. 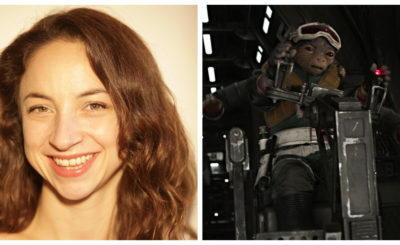 Many of the games she works on are Star Wars games. 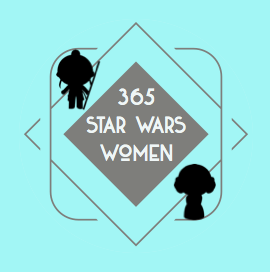 Simone answered a few questions via email for this interview with 365 Days of Star Wars Women. Star Wars has always been a part of my life. I was born a few months before A New Hope was released and grew up with a well-worn VHS. When I was kindergarten age my mom’s friend made me a white polyester Leia costume (complete with cowl) that I wore until it was a stained skin-tight disaster. I have no memory of a time before Star Wars was central to my life. I spend so much of my time absorbing Star Wars that it’s tough to pick just a few. 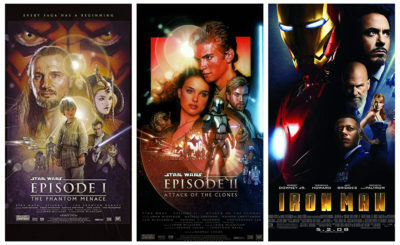 My heart will always belong to the classic era but now that I spend more of my time focusing on the Clone Wars era for work, my love of that time period has grown. I’ve watched the entire run of The Clone Wars twice in the past three years and have gone back to the prequels multiple times. They are our modern mythology. It’s the hero’s journey, the fight between good and evil, belonging to something larger . . . all of it is there, but in a way that makes sense for us now. One of my idols growing up was Joseph Campbell, the PBS series he did with Bill Moyer, The Power of Myth talks a lot about Star Wars in the first episode. I would highly recommend finding it! Beyond that there is something for everyone in Star Wars. There is always someone to identify with, no matter what side of the Imperial/Rebel divide you fall on. This has only grown with the newer movies and I can’t wait to see how having that representation affects the newer generations of Star Wars fans. What is your role at Fantasy Flight Games and how did you get there? So . . . how I got to Fantasy Flight Games is a bit of a story. I’ve worked mostly at small companies that make niche products: guitar effects pedals, vacuum tubes, height-adjustable furniture, novelty housewares, the list goes on. I don’t actually have any relevant school experience, just a string of weird and very specific jobs that got me where I am. In March of 2011 there was a job posting for what might have been the most entry-level office admin job at FFG. I applied, not because I was interested in the job, but because I wanted a tour of the office. I had been a fan of the games for years and it seemed like a fun opportunity to peek behind the curtain. About 15 minutes into the interview I realized that I had ‘found my people’. About 30 minutes into the interview I was trying to justify what would essentially be starting my career track over at the bottom rung of a company. The next week I was processing International Customs Documents in the warehouse. In my first three years I had four positions, and each new role was something I helped create for myself. I was handling all of our global container and customs logistics when I started to get involved with the X-Wing manufacturing process and within the year I was managing the plastic production of ever tiny spaceship we made. Sometime in 2015 we transitioned all that experience in my previous five roles into the new Licensing Manager position. Now I literally spend two-thirds of my week in meetings talking to people about Star Wars. How would you describe Fantasy Flight Games to someone who isn’t familiar with the company, and while we’re at it the difference between role-playing games and other types of card or board games? At its core, FFG is a board game studio that makes thematic board, card, RPG, and miniatures games. We cover pretty much every style of game there is in the hobby industry. We’ve got different teams that specialize in each type of game, which helps each style of game retain their unique flavor. While each type delivers its own experience, a quick breakdown would be that board and card games offer a ruleset and prescribed set of actions and have cards, dice, tokens, and figures that help you visualize all that. Minis games have a bit more freedom, with miniatures and various templates that help you plot out your actions. Finally, RPGs are just a ruleset that creates a sandbox for you and your friends to play in. What’s great for Star Wars fans is that we make a ton of Star Wars games, across all these types of games. If you just want something fun and fast, play Destiny. It’s a collectible card game that lets you pair up heroes or villains from any era and roll these really satisfying dice with full art pieces on each side. Easy enough to play with your ten-year-old niece but challenging enough that there is a huge tournament scene. For Miniatures, we’ve got X-Wing, Armada, and Legion. Each brings a different part of the Star Wars experience to the table. 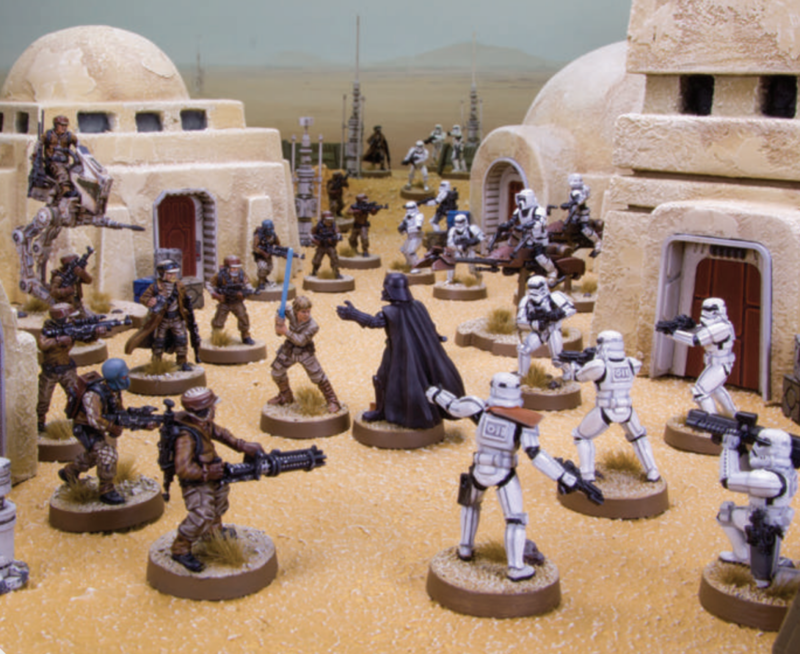 Image from the Rulebook of Star Wars: Legion. With Legion, you’re playing the ground troops and staging battles between the scrappy rebels and the tyrannical Empire. If you want to relive the Battle of Endor, this is the game for you. This is also the game for you if you want to explore the glue and paint side of Hobby Miniatures. Next, you’ve got X-Wing, which I think is our most approachable Miniatures game (and very much my baby). This is all about small, fast ship-to-ship combat. The minis come pre-painted, the rules are easy to grasp, and even the most seasoned players will occasionally make the laser sounds as they play. 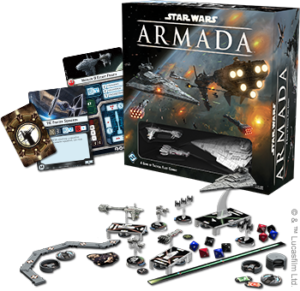 If you’re into planning your moves out three turns in advance and commanding a fleet, then Armada is for you. Think huge battles with capital ships and finding a way to make your various fleets all work together. If you’re looking for a more narrative experience, our board games are for you. Imperial Assault pits a rebel cell against the machinations of the Empire while letting you explore classic locations and meet some dashing allies. It also allows the Imperial player to crush their friends if that’s what they’re into. If you want the most narrative experience, then you need to sit down with a group of friends and get one of our RPG Beginner Boxes. 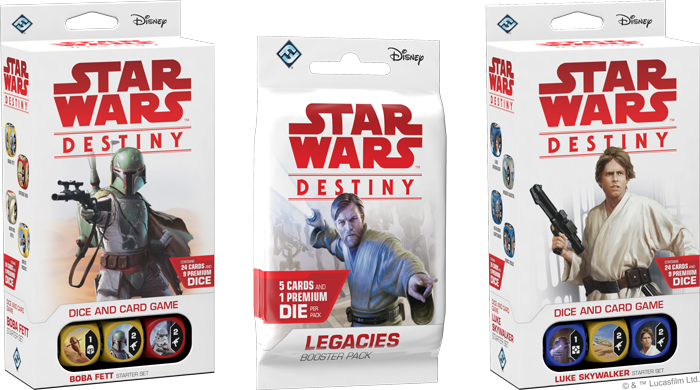 You’ll be able to live out your wildest Star Wars adventures in a sort of sandbox that encourages the Game Master and the players to create the story together. The most important thing is making sure that everyone at the table is having fun. I’ve been known to fudge rules in the spirit of making a game more enjoyable or dynamic. As long as everyone is enjoying themselves, there is no wrong way to play. Is this what it’s like when you ask someone which is their favorite child? X-Wing will always be my baby, I’ve poured more sweat and tears into that game than anything I’ve ever worked on. I love the ships, the paint, the dials, the subtitles on the cards, all of it. That being said, I am terrible at it and have crashed into my own ships and run myself off the edge of the table. How do game developers figure out what characters will be in different games? The needs of the game usually come first. There are tons of cool characters/ships/items in the Star Wars galaxy, but unless there is a compelling reason to put them in the game we usually pass. If you put something in a game but don’t have solid mechanics and a place in the game for them, they can fall flat. That being said, sometimes something or someone is so cool that you’re just waiting for the right place to fit them in. Early in the process the team puts together a list of the different elements that they want to include, and we’ll go over that internally to make sure everything makes sense thematically and mechanically. A lot of discussion happens at this point to make sure everything is staying true to the game as well as Star Wars in general. Finally, however, sometimes the Licensing Manager gets obsessed with a certain character and starts each project meeting by asking, “Is Hondo Ohnaka in this game?” and refuses to move forward until the answer is yes. 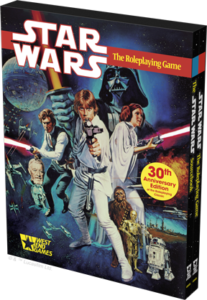 The original Star Wars Roleplaying Game that West End Games put out in 1987 is legendary with some Star Wars fans. For people who have never played the game or read the sourcebook what is the appeal of this game (and really its importance) and why did Fantasy Flight Games put together a 30th Anniversary edition? A lot of us at FFG have history with the original WEG Star Wars games; we know people that worked on it, some of us worked at WEG but not until after the books were published, and some of us have our original copy and brought it into the office so it could be the template that we created the 30th Anniversary Edition based on. 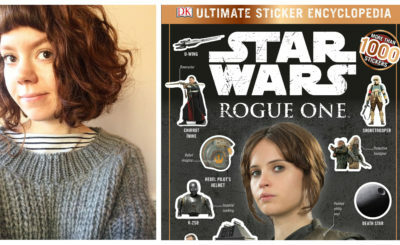 Our Licensing Coordinator, Scheherazade Anisi, used my original copy of the book to find all the art assets in the Lucasfilm digital archives so that the graphic design team could lay out the final book. Since it was published in 1987, there were no digital files and no proofs. Everything had to be sourced and laid out from scratch. I could probably write a whole essay recapping the experience of recreating the book. As for why the book is so important to the Star Wars community, it was published at a time when there was not a lot of Star Wars content. You had the classic movies, a few of the early Han Solo books, the Lando Calrissian Adventures, but beyond that there wasn’t much media. Even people who didn’t play the games would pour over those books for every bit of information. It was a way to engage with Star Wars that fans were hungry for, and at the same time was a way to add so much richness and flavor to the world. There is so much of what is part of the Star Wars lore that started with those books. 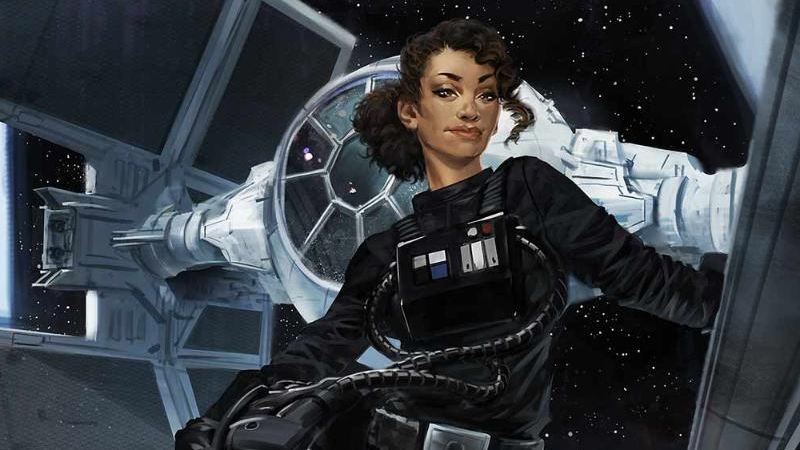 Artwork from the Ciena Ree card in Star Wars: Destiny. The artwork on the cards from some of these games has always impressed me. Does FFG have artists on staff or are all of these artists freelancers? How much artistic freedom do the artist have? Do you have any favorite card artwork? FFG has always been very focused on the visual style of our games and making sure the artwork is top-notch. We have a pool of amazing freelancers that create every bit of art you see on the cards and a team of even more amazing Art Directors that not only wrangle the whole process and make art from multiple freelancers look cohesive, but they also make sure each piece is as expressive and gorgeous as possible. As for artistic freedom, it varies from piece to piece. Sometimes an artist is depicting a very specific moment from one of the movies, so the illustration has to be spot on, but other times the piece is a little more open to letting the artist play around. 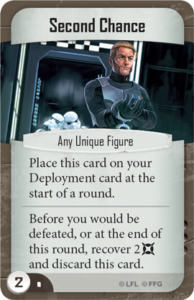 Agent Kallus card from Imperial Assault. I review each piece of Star Wars art and always have favorites from each batch. There are some awesome Aphra images that come to mind but if I can pick two favorites, I would first go with Ciena Ree from Armada. We were the first to depict her and that was such a fun experience to work on and then have The Star Wars Show do the big reveal. My second choice is a fan-girl favorite. I was meeting with the Imperial Assault team about their Tyrants of Lothal expansions and it was after that scene in “Zero Hour” when I told them that they needed to give me a Hot Kallus card. 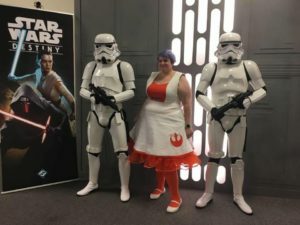 Do you have much contact with Star Wars fans in your role at FFG? Not as much as I would like! For years I ran the FFG Information Booth at Gen Con and it gave me an opportunity to meet hundreds of fans. I was on my first ever panel at the last Star Wars Celebration in Orlando, talking about our games and it was absolutely surreal. At the end of the panel a little girl wanted to have her picture taken with me and I did my very best not to cry. Aside from big conventions, I’m always at our X-Wing World Championships at our campus in Roseville. There are a few players that I cheer on every year. I do find that I’m interacting with fans more and more on Twitter lately, which is always a ton of fun. By the time a product comes out, I’m so far removed from it that it’s always fun to relive the excitement from a fan’s perspective. Is there any way I can convince anyone at FFG to put some more handmaidens in some of your games? I know a person, I’ll see what I can do. You can find Simone on Twitter @dorkgirl and learn more about Fantasy Flight Games on their website.